Customised bandanas are perfect for any promotional event, team build, marathon, sports event, restaurant staff, school uniforms and any indoor or outdoor event. Need your Bandana branded? EASY! We specialise in customised branded bandanas. We are South Africa’s leading supplier of multifunctional, tubular Bandanas. Perfect for your race day, product launch, special event, marathon, team build, corporate clothing, school or college. No Problem! Your Bandanas will be printed in full colour using your artwork or logo. The design for your bandanas can be a simple step-n-repeat of your logo on your chosen colour background or it can be a full colour layout that includes photographs and complicated patterns. We can print anything onto your bandanas, ANY colour, ANY design! Have a look at the gallery for some ideas. Need your bandanas to match your corporate colours and clothing? No problem! 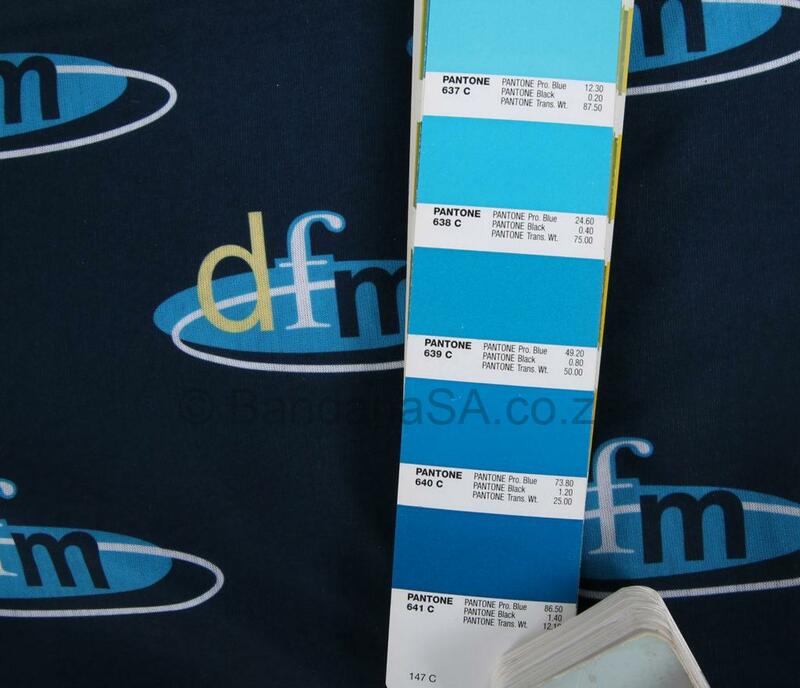 We are able to match pantones codes to ensure your corporate identity stays intact. No problem, we have the widest variety of plain colour bandanas in stock. Click here for our colours. The bandanas we specialise in are the multifunctional tubular-style bandanas that can be worn a number of different ways making them far more versatile and far more appealing as a branded item than those old boring square bandanas. Only 30 units for Customised Bandanas. Only 30 units for Plain colours (unbranded). You can mix & match). Give us your logo and we will do a free step-n-repeat layout for you. As many logos as you want. You can provide your own design too. Keep your Corporate ID in tact. We will match your branded colours. Bandanas are printed in vibrant full color sublimation, not screen printed or embroidered. That’s right, no set up fees! We have the widest range of unbranded bandanas in a variety of colours in stock ready for dispatch. We also keep a small range of patterned bandanas. Due to the versatility of our 100% Polyester Microfibre Bandanas, they will be put to good use by users while engaging in their favorite outdoor activity, providing your company with maximum brand exposure long after the event. Most other promotional items are thrown away after first use. Multifunctional 100% polyester microfibre bandanas are ideal for promotional and advertising purposes. Customised bandanas can be used to promote or launch a product, to re-sell at events, for corporate giveaways, as protective headwear for outdoor staff who are exposed to the elements or part of school uniforms. Ideal for kitchen staff too. The variety of applications are endless. We can print any design you require including photographs as well sophisticated designs with thousands of colour tones. This unique promotional item is a multifunctional headwear accessory made from 100% polyester microfibre. It is stretchy and seamless and provides maximum comfort and protection from sun, wind, cold & dust, including outstanding moisture management and sun protection. A very popular accessory for all outdoor enthusiasts. Many different styles including; The Pirate, beanie, scrunchie, scarf, mask, headscarf, ski mask, headband, your style, etc. Flying out of our office! The bandanas are AWESOME! Thank you SO SO much! I think we will have to order some more they are already flying out of our office! Many thanks again for getting this done so quickly. Thank you so so so much! They are incredible. You and your team do great work. Thanks so so much for everything. What a pleasant and efficient experience. Great service. Firstly, I have never seen a more professional company as yourselves. I did not expect such outstanding service, especially with delivery being 2 weeks early. Secondly, I went through the delivery and it looks fantastic. Great work. I would like to thank you and the team at bandanaSA for the excellent product that you have manufactured for me !!! Thank you for the great service from the beginning of ordering until the end of delivery. A huge thank you also for sending the order earlier, will surely use you again in the near future. I am pleased to say that we have received the buffs, and we love them. It really looks great. Thank you for all your time and effort, I appreciate it a lot!! Have a great day further, and you will definitely here from us again for future orders. I need to order again! Our kids love their buffs and I need to order again! We have received our bandanas and they look beautiful. As soon as these are sold these I would like to place a new order. Thank you for your professional service. We love love them! Stunning work! Thank you so much for everything! Thank you we have received the bandanas. They look awesome, we are very happy with them. Once again thank you for meeting our deadline. I received the order today and they truly are awesome. Thank you so much. Looking forward to doing business with you again.